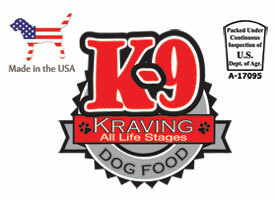 K9 Kraving raw dog food. Thank you in advance for your interest in K-9 Kraving products, we look forward to the opportunity to serve your decision and provide your canine companion with a raw diet – the healthiest feeding alternative. K-9 Kraving is excellent for all dogs especially those with weight or health issues. 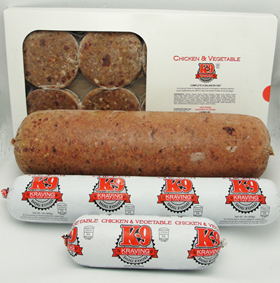 K-9 Kraving is the first USDA Certified, Complete & Balanced raw diet dog food formulated with muscle meat, organ meat, ground bone, low carbohydrate vegetables, and essential vitamins, minerals and trace minerals for your dog’s everyday needs. Formulated to meet the nutritional levels established by the Association of American Feed Control Officials (AAFCO) Dog Food Nutrient Profiles “For All Life Stages”. K-9 Kraving products are free of: preservatives, sugar, dyes, cereal grains, glutens, nitrates, chemicals and soluble carbohydrates.